This contest is now over. Congratulations to Andrea Williams!!! I would love to make a keepsake photo book of my kids for their grandmother. She lives in Florida and we live in Michigan, and I'm TERRIBLE at sending her pictures of the kids! Thanks to Picaboo for sponsoring this post. To learn more about Picaboo photo books, cards, calendars and other printed products visit Picaboo’s website. I was selected for this sponsorship by the Clever Girls Collective, which endorses Blog With Integrity, as I do. A couple weeks ago I wrote about my first experience ordering a Picaboo photo book. They offer a number of photo printing services, including gorgeous full-sized, high-resolution photobooks. I decided to do a photobook highlighting our most recent session with our favorite photographer, Drew B. There were a number of design options, but I chose a simple white background with a classic frame, because I wanted the focus to be on the pictures. Rearranging and resizing the photos was really simple. I think it took me about an hour to create this photobook, and I've really been looking forward to seeing the finished product. The photobook arrived this week and I love it. The cover is leather-bound and hardbook, with a photo on the front. The pages and glossy and large, and the photos are high-definition print quality. But best of all, the pages are crease-free, and they turn really easily because each page of the book is attached to a flexible binding. What kind of photobook would you make? You can enter to win until midnight on Saturday, and winners will be announced next Sunday. Good luck! This contest is now closed. The winner is Cataroo. I think every parent of a preschooler is shocked to discover how much drama can be involved in the simple act of brushing a child's teeth. Kids want to be independent, and in my house we have had many stand-offs over who gets to apply the toothpaste to the toothbrush, and whether or not mom is allowed to brush. If my kids had their way, they would apply the toothpaste to their finger, eat it off, and then go back to eating candy. Luckily, they are not in charge. Teeth are serious business. If kids don't wash behind their ears, the repercussions of some dirt build-up are not going to be life-changing. But the teeth need a lot of attention to avoid cavities, even in childhood. In our house, we've developed an agreement. I brush first, and then they can brush on their own. They’ve come to know this as a part of their nightly routine, but they would still whine about it. Recently, we got to try the new ARM & HAMMER® Spinbrush® MY WAY! ® line of spinning toothbrushes. They come with a packet of stickers so that kids can completely customize their own toothbrush. My kids LOVED this. In fact, the afternoon they spent decorating their toothbrushes may have been the quietest they’ve been all month. The stickers are gender-specific, and included more than enough stickers to decorate in whatever them struck their fancy (though India attempted to use every last one). The boys could choose from dinosaurs, skateboarding, cars, or transformers. The girl pack had rainbows, flowers, and cute decorative icons. Both packs had letter stickers so that the kids could put their own name on their toothbrush. Then, they got to personalize their own toothpaste with the Orajel® MY WAY!™ Toothpaste. Well, I am sure this comes as no surprise, but my kids have never been more excited about brushing their teeth. I really love how this product inspired their creativity and also got them more excited about the nightly routine. They love the spinning, too, and I confess it does make my job a bit easier, too. How many times do you brush your teeth each day? You cab visit this link for the official rules or visit the official sponsor site. For more chances to win, visit the round-up page. This contest is now closed and Tabitha is our winner! I have wood floors throughout my house. I love the fact that they can whether spills and dirt without leaving stains. But I don’t love how filthy they can look after a day of my kids running through the house. It seems like I am always searching for the perfect way to clean them. I used a device with a washable fabric cover for a while, but it was cumbersome having to hold a spray can in one hand while I was scrubbing with the other. My housekeeper, who comes twice a month, uses an old-school mop – this is great for the occasional deep-cleaning but I usually clean my floors multiple times a day. Rigging up a mop seems like a lot of effort. Lately I’ve been relying on Swiffer pads. It’s great that they have the cleaning solution already soaked in to the pad, but one pad only covers a small area, and I don’t love some of the chemical involved, or the fact that I am spending so much money on a pad that will just get thrown away. I was really excited to try the Libman Freedom Spray Mop, because I had heard it was a great alternative to these methods. The Libman mop is similar to a Swiffer system, except that the pad is washable. And – here’s the kicker – you can use whatever solution you want to clean your floors. So if you want to stay green and chemical-free, you can mix up a vinegar-based solution instead of a store-bought version. It Is Green. There are no pads to through away, and no harsh chemicals involved. It Is Cheap. The solution I made to clean my entire house was made of 1 cup of vinegar mixed into warm water, and I only used a fraction of the solution. A bottle of white vinegar is under a dollar, and I can throw the pad into the wash. It Is Easy. I love that the spray mechanism is integrated into the mop so that you can spray and scrub at the same time. I also love the control it gives me to spray more solution on areas where there have been big spills. This mop was a big hit with my boys, too. They were actually fighting over who got to use it first. Two kids fighting over who will clean the floors? SWOON. What is your best household tip? For more chances to win from BlogHer, visit the Exclusive Offers section. The other day, a relative sent my kids a couple family photos that had been printed at Target. My kids were so excited to see these photos. “It’s a real picture!”, my daughter exclaimed. She carried it around the house like a prized treasure. A sad fact dawned on me in that moment: since having kids, I have been terrible about printing photos. I do take a ton of family pictures, but most of them are curated online, either on my blog, or in files on my computer. I have four kids, and only two of them have a printed photo book of their first year. I have not printed a single yearly photo book of their first year. I manage to get great family portraits done at Christmas, and yet there is no physical record of them in my house . . . only on my computer. It’s so bad that I interviewed a babysitter recently at my home, and she asked if I had a picture of the kids around, and the only thing I could do was pull out my laptop. Not a single printed photo of my family exists in my house. I am trying to change this, and so I was really excited to try Picaboo’s services. They offer a number of photo printing services, including gorgeous full-sized, high-resolution photobooks. I started feeling ambitious about getting the baby books done for my last two children, but then decided I needed to focus on our most recent family pictures. I downloaded their program, which took about five minutes. I like the fact that the program downloads to my computer, and then publishes the book once I’m doing. I didn’t have to worry about a slow connection or losing my place if l lost my internet connection. It was really quick to add my photos. I also loved that it auto-filled the pages for me. There were a number of design options, but I chose a simple white background with a classic frame. Rearranging and resizing the photos was really simple. I think it took me about an hour to create this photobook. Once I was finished, it “published” the book and I was able to order it online. I am really looking forward to seeing the finished product, and it inspired me to start on those baby books after all. You can check out Picabooks latests specials by clicking here. And stay tuned . . . I’m going to be hosting a Picaboo giveaway that you won’t want to miss. This is a sponsored post, but the opinions I've expressed here are solely my own and represent my honest viewpoint. Avid has a fun music software program that empowers kids to start creating their own music from an early age. The Groovy Music City software’s easy-to-use interface is ideal for 9 - 12 year olds, and provides kids with the ability to create a wide range of music such as house, hip-hop, classical and jazz – without any previous musical instrument experience. Kids can create songs by arranging a series of entertaining shapes and machines against the backdrop of an animated and futuristic city. A simple drag- and-drop interface lets kids choose from hundreds of rhythms, melodies, bass lines, patterns and chords to compose songs with just a few mouse clicks. They also have the option of selecting from a library of 128 virtual instruments or attaching a MIDI keyboard to create their own unique compositions. Once they compose a song, kids can upload, share and get comments on the music they create at www.GroovyMusic.com - a free online community. GroovyMusic.com also hosts an interactive, weekly Top 10 chart that features the most popular and highly-rated songs uploaded to the site. One thing we like best about this software is that it is compatible with both windows and mac based systems. A good pump can be a new mom's best friend. It can give you a little time away from baby, allow you to breastfeed after returning from work, and even buy you a missed feeding in the middle of the night! There are also a number of situations in which breastfeeding is difficult, and a breast pump allows moms the ability to give their baby breastmilk without nursing, or to take a few days off without losing their supply. Some mothers who become experienced at pumping find that they are able to pump far more milk than their baby is consuming, and are even able to share their milk with milk banks that distribute the milk to sick and premature babies. The First Years miPump Basic Double Pump - The miPump is the perfect choice for moms on a budget. At under $80, it is the cheapest double electric pump on the market. It is compact and quiet, and it comes with a bag so it’s easy to carry and discreet. It’s small enough to carry in your purse and quiet enough that only mom knows she’s pumping. A convenient battery option means you can pump anywhere - I used mine in the nursing room at Disneyland recently. One of my favorite features is that the miPump includes a handle that allows you to pump with only one hand, so you can multi-task while pumping. 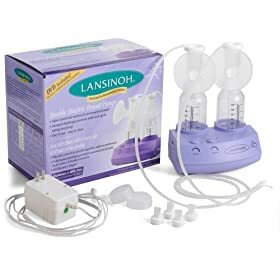 Lansinoh® Double Electric Breast Pump - The Lansinoh Double Electric Breast Pump is ideal for a busy breastfeeding mom. This pump is designed for everyday long term use at home or away. At under $200 retail, the Lansinoh is nearly $100 cheaper than most comparable breast pumps. It's extremely portable and not couched in a backpack like other pumps. You could toss the Lansinoh pump in a large purse or tote bag and hardly even know it was in there. It can take six AA batteriesm and you can adjust both cycle/speed and vacuum/suction for personal preference. My favorite part is that there are minimal parts, so it's easy peasy to clean! Medela Swing Single Breast Pump - Medela is the Cadillac of breast pumps. It's a classic. But their new single pump, the Swing, stands out as a great mom on the go. It's very small, but it operates just like the Pump In Style, which many moms have turned to as their pump of choice. It can work with an AC adapter or four AA batteries and can be set on a tabletop, clipped to a belt or worn around the shoulder or neck while pumping. It has a 2-Phase Expression technology that has been proven to get moms more milk in less time. Another feature I love about Medela pumps - all parts are BPA-free and fit with Evenflo or Gerber bottles. Avent Isis iQ Duo Twin Electronic Breast Pump - this pump has two major features that stand out from the rest. First, it is clinically proven to be more effective than a hospital-grade electric pump, by mimicking both stimulation and expression. It's other claim to fame is that it is the first "smart' breast pump. It includes a memory feature that mimics mom and baby’s personal pumping rhythm. You start with pumping manually. The pump learns your touch and when you’re ready – quietly, electronically – it takes over your rhythm. You can also change your pumping rhythm any time you wish. While it's more expensive then other pumps, this is a great option for moms who are pumping exlusively. Overscheduled families and families on a budget are turning to the "staycation" for their vacation time. What is a staycation? It's a vacation where you stay locally, and enjoy an area near your own home, without the responsibilities of being at home. Several magazines have recently covered the "staycation," encouraging people to spend their vacation seeing what their own city has to offer instead of leaving town. This is a great option because it alleviates the stress of flying with kids, the swelling of our carbon footprint, and the added cost of airfare. Many of us just need some time to stop, breathe, relax and rejuvenate. We decided to try to give the staycation a try at the Waterfront Hilton in Huntington Beach. We drive past this beach-front hotel on a regular basis but of course we've never been inside. For us, the timing was perfect. I am due to have my baby next week and those last few weeks of pregnancy can be really tedious. It was so nice to have something to look forward to before labor. But what I realized on the trip is how valuable it was to have one last vacation with my family of four, before we grow to five. It felt like such an amazing bonding time for us, and I loved that we got quality time knowing that there would be an interruption in the family soon. I hope this little trip will make up for the displacement they might feel next week as I stay in the hospital and they stay at Grandma’s for a few nights. I had never been one for the idea of a “staycation”. In fact, my ideal of a vacation usually involves getting my passport stamped and drinking coke out of bottles in a place where you can’t drink the water. I like my vacations exotic and culturally challenging. So to think of staying here in the OC was an interesting twist. However, it turned out to be such a good solution for a short getaway. We were able to prepare and pack very casually. And I can't tell you how great it was to arrive at our destination without once being asked "how long 'till we get there". Another perk - when we left our house, it was around dinnertime. So on the way to the hotel, we grabbed some take-out from a favorite local spot and took it to the room. It was a great way to save some money and the kids thought it was so cool to have a "picnic" on the balcony of our hotel room. I thought eating overlooking the ocean was pretty cool, too! The Waterfront Hilton was very nice, and even though we were only a few minutes away, I immediately slipped into vacation mode. The kids were impressed with beds and the huge sliding window where they could watch surfers and hang-gliders from our room. The hotel offers a s'mores package for families - a wagon filled with hot chocolate, s'mores goodies, firewood, beach chairs . . . everything you need for a family firepit on the beach. Huntington Beach has so many free firepits, but it is one of those things, again, that we have never done despite the close proximity. Even though it was a little work (Mark had to rely on his Boy Scout skills to get the fire going), it was so fun to snuggle on the beach with our kids and eat some sticky treats. My kids still talk about that night. More and more hotels are beginning to cater to the family set, and Waterfront Hilton was no exception. We were thrilled to find that room service had a kid's menu that was actually reasonable. Another great practical aspect of this resort was the “The Green Room”, an environmentally-friendly laundry room available free to all guests of the hotel. The theory is that it gives guests the opportunity to pack less and wash their sun and sand-drenched beach wear and other items during their stay. This came in very handy with our kid's swimsuits, and also in the middle of the night when India threw up on her favorite blanket. We were very thankful for a fast wash cycle that night! Another great thing about the staycation . . . we cheated. We went home one afternoon and all took a big long nap because the kids were having trouble napping in the hotel room (too much excitement about visiting the pool). Mark and I got to relax and pick up a few forgotten items, and we returned to the hotel refreshed and ready for more fun! I think it might be my new favorite way to do vacation. want to hear from you! we ask the thought-provoking (or completely random) questions, you answer. This is also a space to confess when we've been “that mom”. let’s own it and move on. you’re only as sick as your secrets, ladies.